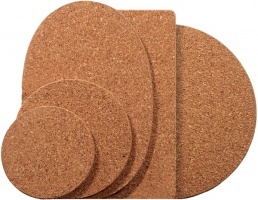 Cork Coasters made of natural and recyclable cork from Portugal. Buying and using cork products contributes to preserve a natural, renewable resource and an important ecological environment in the western Mediterranean countries. Cork mat with magnet. The mat´s magnetic base firmly secures all pots and pans with magnetic bottom, for example cast iron and cookware suitable for induction hobs.